A pile is basically a long cylinder of a strong material such as concrete that is pushed into the ground to act as a steady support for structures built on top of it. Pile foundation has many applications as will be explained below. In foundation practices, the main point of concern is bearing capacity of soil. Bearing capacity can be defined as the maximum load that can be carried by the soil strata. When the soil is strong enough that it can carry the whole load coming on it, then we use shallow foundation. Shallow foundations are usually used where hard soil strata is available at such a depth that construction of foundation is not too costly. If hard soil is available at deeper levels of earth, then there is a need of some source that can transfer the load of the structures on the deep hard soil strata. This source can be said to be as the deep foundation. Pile foundation is a type of foundation in which pile is usually used as the source to transfer the load to deep soil levels. 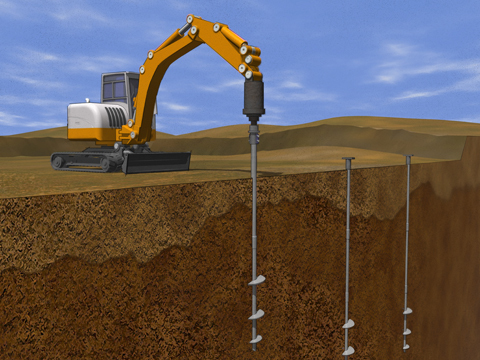 Piles are long and slender members that transfer the load to hard soil ignoring the soil of low bearing capacity. Transfer of load depends on capacity of pile. There is a need that pile should be strong enough to transfer the whole load coming on it to underlying hard strata. For this purpose, pile design is usually given much consideration. Depending on the load, type of material is usually selected for the piles. In actual construction, first pile load test is performed on the soil to verify soil strength that whether it can take the load of pile or not. The total load carried by the pile and its elements is said to be the ultimate load. It is usually denoted by 'Qu'. Load that can be carried by pile is due to its shaft and bearing resistance. Too much close spacing between the piles causes overlapping of pressure bulb. Piles should be spaced so that the bearing capacity of group is not less than bearing capacities of individual piles in group. The fill above the original soil in which pile group is established usually settle down under its own weight. This will exert drag on pile in addition to friction between pile and soil. This adds to the load on the pile instead of resisting it. It is said to be as negative skin friction. Being the extra load it must be taken into account in design of pile foundation.